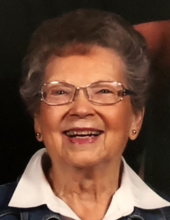 Florence M. Pickard, 92 of Mason City, died peacefully on Tuesday, February 5, 2019 at the Muse-Norris Hospice Inpatient Unit in Mason City. A funeral service will be held on Tuesday, February 12, 2019 at 11:00 AM at Wesley United Methodist Church, 1405 South Pennsylvania, with Pastor Steve Hansen officiating. A visitation will be held one hour prior to the service. Interment will be at Riverview Cemetery in Algona, Iowa. Memorials can be directed to the family of Florence Pickard and will be given to her church and to the Hospice House. Florence Marie Pickard was born on April 8, 1926 to Henry and Alice (Wise) Phillips in rural Britt, Iowa. She was the third of four children. She grew up and attended high school in Algona, Iowa where she also met her husband Garnet. She and Garnet were united in marriage on October 1, 1944 at the Methodist Church in Algona. Two children were born to this union, Mary and Patti. Florence and Garnet moved to Mason City in 1953. At age of 40 years, Florence decided to obtain her GED and continued on to obtain her LPN nursing degree in 1967. She worked for Mercy Hospital in ICU and CCU for 2 years and then for the office of Drs Houlihan, Baker and Coddington until her retirement in 1989. In her free time Florence enjoyed crocheting, crafts and baking. She was also an avid seamstress and made her daughters formals and the wedding dress of her grandson’s future wife. Florence loved to go dancing with Garnet at the Surf Ballroom; listening to Big Band music and playing cards with friends. In recent years she enjoyed playing the domino game “Mexican Train” with her neighbor and friend Jack. She was an active member of the United Methodist Women; where she held various offices, served on the Church board, and taught Sunday school. She was also an active member of the PTA. After retirement she volunteered at Mercy Hospital for 10 plus years. Florence is survived by her two daughters, Mary (Jim) Zilka of Sauk Centre, MN and Patti (Denny) Warren of Ankeny, IA; 7 grandchildren, Steven, Scott (Rachael), Ashley (Ryan), Lindsey (Jase), Whitney, Kim (Chris) and Jeff (Tara); 13 great grandchildren; 2 great-great grandchildren and nieces and nephews. To send flowers or a remembrance gift to the family of Florence M. Pickard, please visit our Tribute Store. "Email Address" would like to share the life celebration of Florence M. Pickard. Click on the "link" to go to share a favorite memory or leave a condolence message for the family.